Quite often we develop taxonomies that have many sub types for each Content Type. This can get awkward when the Library has many Content Types causing the view to get very wide. One option is to create a calculated column that combines the site columns into a single column. Please note that to get this to work properly you should make the default on a choice column blank. Otherwise, it will show the default choice for each site column. Lets start creating our new calculated column! Click on the cog in the upper right of the screen. 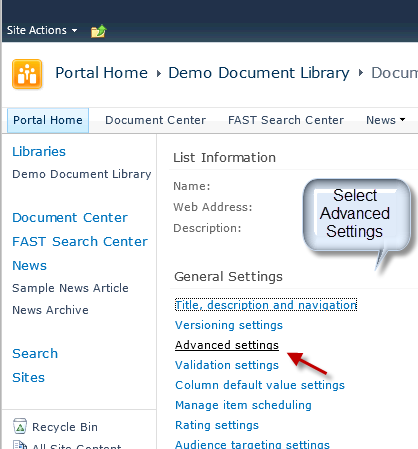 Then select Site Settings (you will need at least design permissions to create a new site column). Then click on Site Columns under the Web Designer Galleries section. After that, click on Create in the upper left of the screen. Select the Calculated (calculation based on other columns) radio button. For this exercise we will be combining Column 1 and Column 2. Click on the formula area and enter =. On the right select Column 1 and click on add to formula. Then enter & and select Column 2 and click on add to formula. Next add you new Calculated Column to your view and you are good to go! Well now that we have a brand spanking new document library lets take a moment to set it up to manage content types. Again, please make sure that you have the proper rights to modify the library settings. It’s actually quite easy to set up a library to start utilizing content types. So lets do that. First make sure that you are in the location of your library and select the Library Tab. Then select library settings over on the right hand side of the screen. Then lets select Advanced Settings. Now lets change the very first option of Allow Management of Content Types to “YES”. We are almost done. Now scroll all the way to the bottom of Advanced Settings and click on the OK button to save our new settings. See that was easy. Now we are ready to start using Content Types. In my next post, I will go through setting up our first of many Content Types. Please note that this whole series is utilizing SharePoint 2010 SP1. If you want to start using content types, you are going to need a few things to get started. The main thing that you are going to need is a site that you have sufficient rights to create and manage a new Document Library (preferably as the site collection administrator). So lets create a Document Library in our Site. Start by selecting the Site Actions drop down in the upper left hand corner of your SharePoint Site. Then Select New Document Library from the drop down. 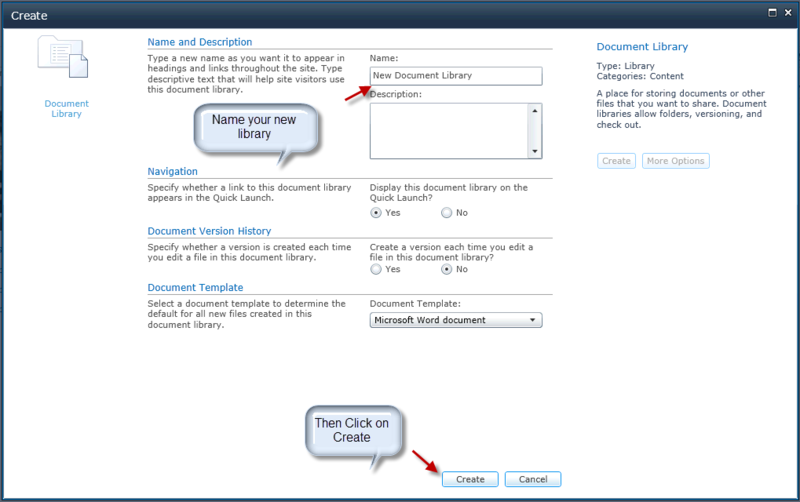 Then enter your new libraries name and select OK.
Great now we have a brand new document library to play with. Next up, we will configure the newly created document library to utilize content types. Ah Content Types, the root of any good Content Management System. Many a user has asked me “why do we need multiple Content Types?” It is a good question in that SharePoint 2010 has powerful full text searching (the ability to search on the contents of a piece of content). The first four things that come to mind, in no particular order, when I think of content types are Metadata, Search, Navigation and Views. Metadata, data about the data, can not only provide enhance search functionality, it can provide powerful navigation, as well. Metadata may contain information that is within the contents of the content or could be data that provides further descriptions or references to the content. The ability to categorize content into different buckets, as well as, associate diverse sets of metadata to each Content Type can make search even more robust. Say I wanted to find all the invoices that were produced between a certain date ranges, by a certain person, for a particular company. We could find this document utilizing full text search if all the required information was contained within the content of the document. Most likely it isn’t. This is where that handy metadata comes in. 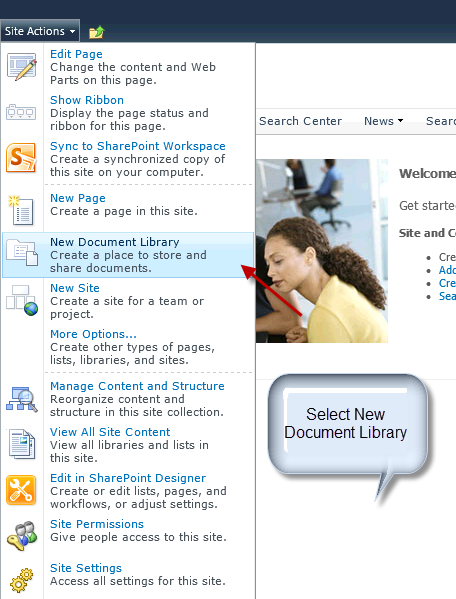 In SharePoint 2010, there is a powerful tool called Metadata Navigation. When the metadata is defined appropriately, Metadata Navigation can replace even the most complex outdated and inflexible folder structures. The key to success in implementing Metadata Navigation is to have navigational flow in mind up front when creating your metadata for each unique content type. Content types and they associated metadata are key to being to create useful customized view, in SharePoint. Some of the main features of views in SharePoint are the ability to sort, group, and filter to create customized views based upon your metadata associated with your content types. In the next few weeks, I will go into each of these areas further and provide some relevant screenshot examples. If you have any questions feel free to comment or contact me at rob@sharepointholmes.com or on twitter at @drholmesnj. Welcome to my new Blog! I am very excited to share with you my Business Analysis insights into SharePoint. I hope my insights are helpful and I welcome any and all constructive comments/and or additions. If you have any particular topics that you would like to hear about, you can contact me via email at Rob@SharePointHolmes.com or on twitter @SPHolmes1 and I will add it to my list. I look forward to sharing with you. My first post will be on the challenges with content types and I think I will call it ” Constant Content Quandaries” (quite the tongue twister, no? ).